Each Young Artist will perform or display two pieces and talk about what has inspired their art. The Young Artist Showcase will conclude with each Young Artist receiving a scholarship towards their arts education from the following generous sponsors: Griffin and Jordan, LaBree’s Bakery, MacDonald, Chase, & Dufour, Noonan Chiropractic, The Rock Team, The Store/Ampersand, and Veazie Veterinary Clinic. The Young Artist Showcase is free and open to the public and is a fantastic way to support the arts and the budding talent in our community. The Young Artist Showcase is co-sponsored by the School of Performing Arts. 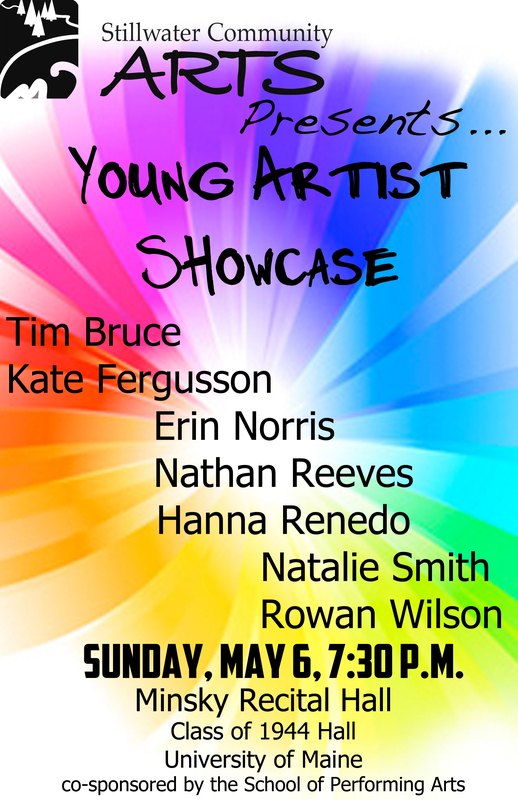 Young Artist Showcase- Sunday, May 6 at 7:30 p.m.